A lot of people think that when you’re released from medical care, you’re cured and that’s the end of it. With me, that wasn’t the case. 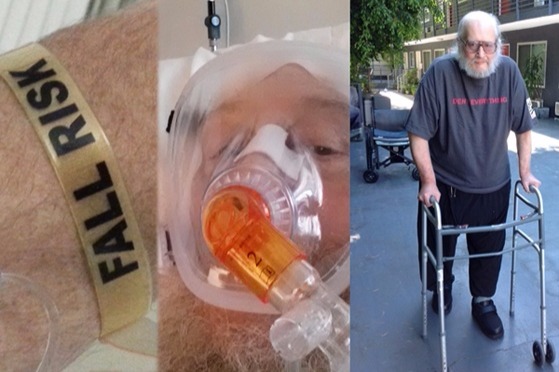 I’m in a long, hard struggle to regain my walking ability, and I need your support to carry on, and survive while doing it. It's hard for me to ask this, but I have to. I’m Jim Wheelock. 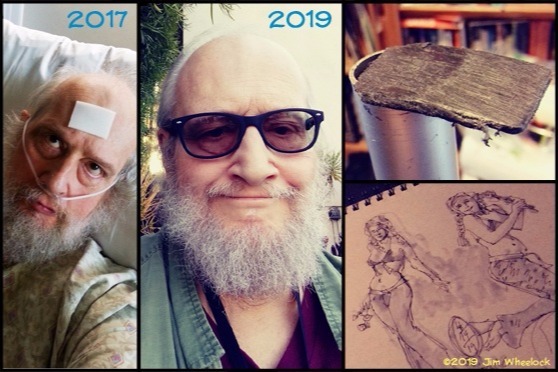 I’m a 65 year-old artist, writer, and current wheelchair commander. On September 29th, 2017 I tripped on a car barrier in a parking garage in Glendale, California, and fell, impacting hard on the concrete. I didn’t see my apartment or any other part of my real life for seven months. Instead, I was trapped in a vicious cycle between hospital stays and far too much time in a hellish rest home in North Hollywood, well-described in a review as “a place people go to die”. I nearly did, twice. The literally toxic atmosphere at the facility made two hospital side-trips necessary due to breathing issues. I had to be treated for pneumonia, bronchitis, and influenza. I was lucky when I fell, if you want to call it that, I didn’t hit my head, or lose consciousness at all, so there was no concussion, and, while My legs were weakened severely, there were no breaks or fractures anywhere,but a laundry list of health problems surfaced that had been brimming under the surface, caused or made worse by the fall. When I went into the emergency room, I had dangerously low oxygen levels, and even now. I continue to use an oxygen concentrator, although I’m weening off of it as I get healthier. I have systolic congestive heart failure, hypokalemia, atrial fibrillation, as well as chronic diabetes. I take blood thinners, both for my heart and to prevent a recurrence of a pulmonary embolism I suffered back in 2001. I also take a strong diuretic to prevent liquid build-up in my system. All of issues are currently under control, although I am now being treated for diabetic wounds at a wound center. In the rest home, only my physical therapists treated me as someone capable of going back into the world. Everyone else on the staff saw me as just another “lifer”, doomed to be in that place until the very end. I struggled for months to get out of there, until finally I got my wish -- because Medicare would no longer pay for my physical therapy. I’m home now, and happier and healthier for it, but my life is a constant struggle. I spend most of my time in a wheelchair, and use a walker to walk. Every day, I’m walking further and longer, relearning and building on those skills I lost in my fall and the weeks in bed that followed. Right now, I’m largely confined to my apartment and the courtyard outside it. The only time I get out of my building is when I take an insurance-paid wheelchair transport to a doctor’s appointment. I’m an artist. Some of you will know me from my work in TV animation on shows like THE ADVENTURES OF THE GALAXY RANGERS, G.I. JOE: EXTREME, and ALL DOGS GO TO HEAVEN: THE SERIES, or from my work in independent comics, such as TABOO, and the graphic novel, INFERNO: LOS ANGELES. For years, I was a regular at several local figure drawing sessions. Drawing helped me keep up my sense of self-worth even in the darkest times, and I miss it a lot. I’m deprived of this until I can walk up and down the staircase to my building’s garage again, and get in my car and drive out into the world. That time is probably month’s away, but I know it will come. I have a care provider for about 16 hours a week. He helps me on the trips to the doctor’s, and with cleaning, laundry, and follows me with the wheelchair when I practice walking, but other than that, except for a few friends, I’m on my own. What family I have is on the East Coast, and can’t really do more than encourage me. Compared to in the nursing home, which went out of its way to make me believe I couldn’t function without them, I have to do practically everything here on my own. It’s a good feeling, but very hard on me. I’m coming to you on GoFundMe asking for financial help to keep going. I spend long, lonely, nights constantly worrying about money. With help, I have a sustainable life style. I live in a rent-stabilized one-bedroom apartment in Hollywood, California. My rent is cheap for almost anywhere, although still more than my $669 Social Security check. Staying here is still a far better choice that an expensive move elsewhere, if, in fact, I had anywhere else to go. My original plan was to retire to a reasonably priced part of Europe. This hope was destroyed when my nest egg, a carefully preserved comic book collection that was professionally appraised at $136,310.22, was stolen from my storage space four years ago. The thief was caught on camera in another robbery at the storage building, and confessed. Everything he took of mine was gone, except for a portion of my LP record collection that a wonderful local music store owner contacted me about. As far as I know, the thief never spent a minute in jail. He got off with a suspended sentence and community service in a plea bargain that I strongly objected to. The state however, cared more about saving the cost of a trial that about me and the other 9 victims. He was ordered to pay me $10,000 in restitution. The State of Vermont advanced ne $5000 at the time, which helped get me make it through, but he is now paying me off at a court-allowed rate of ten dollars a month! By my calculation, that gives him about 40 years to settle with me. Sadly, that has become far worse than accurate. I’m now unable to work at all, as my health care issues and my struggle to recover my ability to walk take up virtually all of my time. The ongoing expense of both maintaining my apartment and paying for my rent, utilities, medical supplies, internet and just buying food and necessary home items is bone-crushing. What I’m asking for with this GoFundMe campaign is support to keep going on, and healing, at a point where I have few resources left, and nowhere else to turn. Evening it off, I need $1390 in addition to my Social Security every month to live. This is ongoing, every month. It’s not a lot to many people, just more than I have, and at this point more than I have any hope of getting on my own. That’s why I’m coming to you for help -- slowly, sometime shakily, in my wheelchair and on my walker. I’ve set my goal for $13,000, which is roughly 9 months budget. I need help immediately, and my need is ongoing, so please be kind enough to help with what you can. Small donations build up in the long run. Donations can be made from most of the foreign countries you might be in. If you have any questions, please contact me via GoFundMe, and I will do my best to answer them. Again, thanks for your help and support. I've been accentuating the positive in my recent updates. I’ve come a long way from wallowing in my bed in a hellhole rest home 19 months ago to where I am now. It’s taken a long time, and it’s been very hard and often painful. It still is. I’m proud to tell you about it, and I will in a minute. I fear, though, that updating the good news is somehow making some of you less inclined to donate. In reality I’m at the point where I need your help the most. Your support has gotten me where I am. Tuesday was my 43rd day of continuous walking with my walker, usually on a quarter to half-mile route. Take a look in the picture at the damage my hiking did to one of my walker ski glides. That was new two weeks ago. There’s also a photo from the figure drawing session I finally made it to on Sunday the 14th. This was the first time I’ve been ANYWHERE for a non-medical reason in 19 months. You might remember from my GFM statement that doing this was one of the big things I wanted to do when I resumed real life. I did it, and it proved to me that I can function in the outside world again. It wasn’t easy: I had to use just the walker, because Access Paratransit wouldn’t allow my oversized wheelchair in their vehicle. You’ll also notice my new glasses, which your kind help enabled me to get. My vision had changed much more than I imagined in the eight or so years since I got my last pair, so seeing clearly again was a wonderful shock. Thanks to all of you who got me there. In addition, just last week, my diabetic leg wounds were declared healed, including the toe that was on the verge of amputation a few months ago, and I was discharged from the Wound Center at Glendale Memorial Hospital. Your donations bought me the Circaid Juxtalite compression stockings that my insurance wouldn’t cover. They were a big factor in this turn around -- and now, I’m afraid, need to be replaced. With my wounds healed, I was also discharged yesterday by my home nursing service, which means I’ve also lost any hope of getting Physical Therapy at home. Now that I have to go outside for all my medical services and PT, mobility becomes an even bigger issue. The single thing I can do now to improve my life immediately is to get my car back on the road. It sounds like a First World problem, but it isn't. It will give me easy access to events and services I’ve done without, and will enable me to go to many medical appointments without having to use complicated wheelchair transportation. I went into detail in an earlier update on what I need to do to get rolling again -- getting a new battery, and re-insuring, re-registering and getting the car smog inspected. I need to get this done soon to take advantage of a deal from my insurance company. I need to have about $450 in hand to make this overcomplicated mission happen. This is where I ask you for your kind donations, old friends and new supporters, alike. I need this $450 and in addition, I need about $350 to cover my internet, phone, gas, and electric bills -- all due now! Please do what you can. This GoFundMe remains my only income besides my miniscule social security check, which is swallowed by the rent. Even small donations help, although I can use some large ones. Besides GFM, you can also use PayPal, which is faster. PM me for the e-mail to use. I’m open, of course, to any other method you might prefer. Please be kind enough to share this in any media you’re attached to. Thanks, as always, for your great help. Thank you for your great help so far. I’ve been able to cover some of my immediate bills with your donations. I still urgently need about $450 to get my car back on the road, and I need it as soon as possible. Big changes in my situation in the last week have made me realize how important it is I get this done. I expect to lose my home nurse care service in the next week or so, and with it any hope of further home physical therapy. This means I’ll need to travel more to get the medical and PT services available to me. I’m also scheduled for an evaluation by the service that pays for my caregiver/assistant, whose main job is helping me with errands and wheelchair transport. I’m concerned that I’ll lose his help based on the evaluation. Even if I don’t, his car was just totaled in a collision. Until he gets another one, I can’t count on him for help of any kind. Using a combination of the car and my walker, I’ll be able to do things I’ve depended on him for, such as picking up prescriptions and other easy errands. This week I also had major transportation problems, causing me to miss a diabetic wound care appointment. 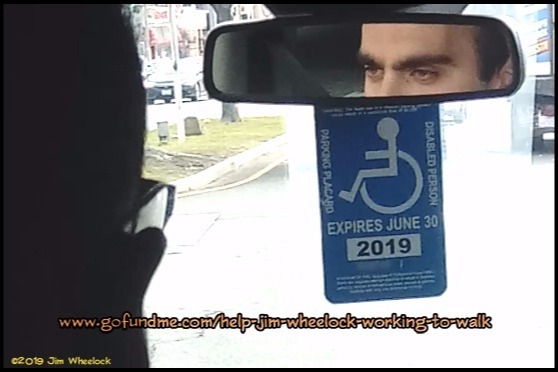 At it’s best, riding in a wheelchair in a medical transport van is as close to being kidnapped as you can get without benefit of a blindfold and a guy named Vinnie, but this was cluster-fracked mess. I’ll go into gory detail on my Facebook page, but here’s the short version: Logisticare booked me with a taxi company whose vehicles can’t fit my wheelchair, rather than a standard medical transport firm, and then lost the reservation, so I was waiting for a ride that wasn’t even coming. When they rebooked me with the same company, the driver turned up half an hour after the doctor I was going to see left the office. This clearly lends more impetus to my need to control my own transportation. I’m at a crucial time in my healing process, as I become stronger and move back into the world. Right now, I need more support, rather than less, as I start to get it done. I know it’s tax season, and that many of you have been bitten by the new laws, but I need the help and have to ask. Please send what you can, via GoFundMe, or by PayPal, which is faster. You can PM me for the e-mail address for PayPal. I’ll also remind you that smaller donations add up, although I could use a few big ones. As always, thanks for your past and continuing help. It remains deeply appreciated. Please be kind to enough to share this, as well. In other news, yesterday was Day 32 of my continuous walker walking regime. Yesterday was Day 30 of my consecutive Daily Walker Walkathon. It’s still hard, and I’m still not completely healed, but I’m far from being the shattered wreck who got toted out of a hellhole nursing home on a gurney a little over a year ago. You help is what’s getting me there. Things are finally changing for me, but I need your kind donations desperately to keep making this kind of progress. 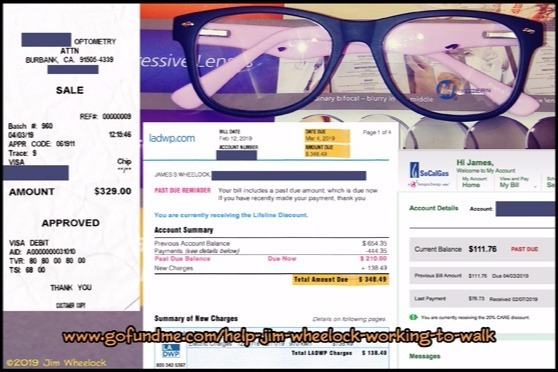 Last week, with your help, I was able to go to the optometrist for a diabetic eye exam, and to order sorely needed new glasses. The bill came in at $329, $21 less than my estimate of $350. I had that to give them, thanks to you, but, after also paying my Emergency Lifeline service, I’m left with nothing in the bank to continue onward. 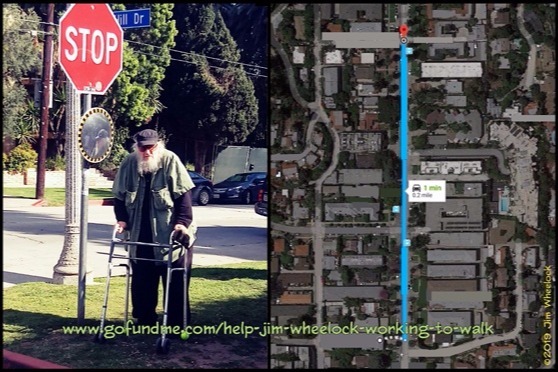 I need some help immediately to buy food and supplies for the next week, including new walker glides, which I’m burning through at an amazing rate. Right now the total for these looks like about $160. If possible, I need this right away. Beyond that, I’m still overwhelmed by my backlog of electric and gas bills. As you can see in the picture, I’ve paid $444.35 so far on the electric bill with your help. With new charges, there’s still $348.49 To cover. The gas still has a balance due of $111.76. There will be a couple of hundred due on my phone and internet in a week or so, as well. First, I have to get the car started and re-registered almost simultaneously, in a kind of elaborate Rube Goldberg process. I filed a Certificate of Non-Use on my trusty Ford Focus while I was in rehab, in order to avoid paying insurance and the more expensive full registration fee on a car I couldn’t drive. The vehicle was due for smog inspection at the time, which was also waived due to non-operation. That all has to be done before I can leave my parking spot. This is how it has to go down, like an uber-complicated Rube Goldberg machine: First, I need to go to AAA, which has DMV services, and get a one-day permit to drive the car to be inspected; I also need to have insurance in place, which will be around $100 for the first payment. Then, I have to call AAA Roadside Assistance to get it started. I expect to need a new battery, which will cost about $150, so I have to have that money available, as well. If I’m lucky, this will get me rolling. Then I need to drive to an Inspection Only station to get a smog inspection, which runs around $75. Again, if I’m lucky, the car will pass, and I can head back to AAA and actually register it. The fee for this is $130. Once I’ve got the sticker, I’ll finally be street legal, and no longer dependent on the whims of medical transport companies. Because of the 24 hour permit, I need to hobble rapidly with my walker to get all this done in a single day. Assuming everything goes well, I’m going to need about $500 in my account to do it, as I said. If the car fails the smog inspection, I’ll have to take it to a mechanic for repair, and then have it retested, which could cost another $200 or more. As an estimate, I’m going to need to raise a total of about $1200 in the next couple of weeks to do all this. It’s a lot. I’d hoped when I started this GoFundMe to build up a balance so I’d able to do these things without haven’t to stress the money at the same time. I had that plan, but it didn’t work. I wish I didn’t have to, but I need to ask you kind donors, and new friends, too, to help me with this. I know it’s tax season, and that many of you have been bitten by the new laws, but I need the help and have to ask. Please send what you can, via GoFundMe, or by PayPal, which is faster. You can PM me for the email address for PayPal. I’ll also remind you that smaller donations add up, although I could use a few big ones. Today we go into URGENT mode. I need to have just $165 more to cover my eye exam and new eyeglasses tomorrow, Wednesday, and also pay my Lifeline payment which is due . Please be kind enough to help if you can. If you've been thinking of donating, now would be spectacular time. and of course, repeat supporters are much loved. You can use GFM, or PayPal, which is faster. PM me for the e-mail for PayPal. Today will my 23rd consecutive day of walking. I'm burning through 3 pairs a week of tennis ball walker glides. It's getting expensive. Thanks very much for your continuing support.